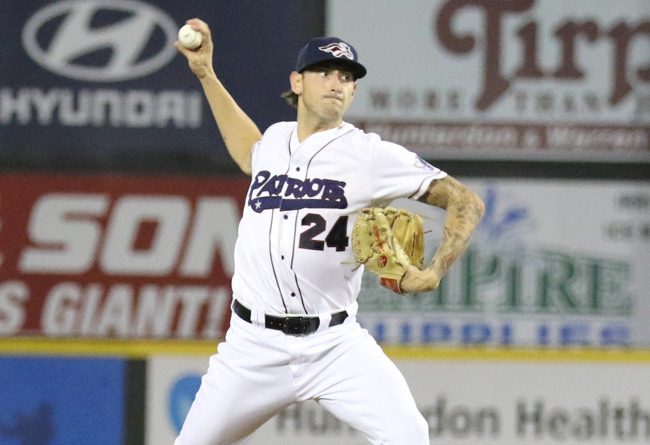 (Bridgewater, N.J., March 1, 2019) - The Somerset Patriots have re-signed Atlantic League All-Star right-handed pitcher David Kubiak for the 2019 season. Kubiak enters his third season with the Somerset Patriots and fourth in the Atlantic League. The 6’7” righty joined the team at the end of May last year and immediately made an impact. He tossed five shutout innings with six strikeouts in his first start and parlayed that impressive debut into another strong season. Kubiak ultimately went 8-3 with a 3.40 ERA and 95 strikeouts over 82 innings pitched in his 14 starts with Somerset. The Riverhead, New York native was 3-0 with a 1.50 ERA and a 36/4 K/BB rate over his first five starts of the year. Kubiak then enjoyed a dominant stretch of five starts from July 3 to July 25 over which he went 4-0 with a 1.34 (five earned runs over 33.2 IP) and 42 strikeouts. At the time that his contract was purchased by Generales de Durango (Mexico) in early August, Kubiak led the league in ERA (2.55), was tied for the league lead in wins (8) and ranked second in strikeouts (93). The SUNY Albany alumnus had at least eight strikeouts in eight of his 14 starts and allowed two or fewer runs in 11 of his 14 starts. He finished his season by allowing three runs over six innings with five strikeouts in a winning effort over the Long Island Ducks in Game Three of the Liberty Division Championship Series. Kubiak made 21 appearances (18 starts) with the Patriots in 2017. He earned five wins and carried a 3.83 ERA with 117 strikeouts against 34 walks over 112.2 innings pitched. After starting the year as a reliever, Kubiak transitioned into the starting rotation and was later selected to the 2017 Atlantic League All-Star Game. The Fubon Guardians of the Chinese Professional Baseball League purchased his contract in late August. At the time when his contract was purchased, Kubiak ranked second in the league in strikeouts (117) and tenth in ERA (3.83). Overall, the former Great Dane is 13-13 with 3.65 ERA and 212 strikeouts over 194.2 innings of work in his two seasons with the Patriots. Kubiak carried a 1.42 ERA over three appearances in the New York Yankees organization at the Double-A level in 2016 sandwiched around 20 games (15 starts) with the Bridgeport Bluefish – his first stint in the Atlantic League. In Bridgeport, Kubiak went 7-4 with a 3.75 ERA and 106 strikeouts over 100.2 innings of work. The former Tampa Bays draft pick previously spent three seasons in the Frontier League, including a 2014 campaign in which he went 7-2 with a 1.50 ERA and seven saves over 48 innings in 38 combined appearances between Southern Illinois and Joliet. Kubiak owns a 3.55 ERA and 643 strikeouts over 192 games (78 starts) in his seven-year professional career.